The unconstitutional vote of October the 1st has created an instability on the markets and on YTM (yield to maturity) of Spanish bonds. However, the effects predicted before the vote were worse and we can’t be sure about future development. Even if the anti-Europeanism and populism fears seemed over after French and German elections, the last violent events in Barcelona show that it may not be really so. A chaotic and instable situation was caused in Spain by a group of separatists that asked for an independence referendum that increased hopes for separatist movements all over Europe. Only 42% of eligible voters went to the pools on October the 1st and 90% of them voted for independence. It may seem a great success for democracy but in reality, the referendum was not constitutional and, therefore, not acceptable by the central government of Madrid. The government of Mariano Rajoy tried to prevent the vote from happening but the result has been a Sunday stained with violence and blood. The national police conducted attacks against the civil population that caused more than 800 injured civilians. After the positive vote and the violence of the day, Catalonia’s president has announced the creation of a committee of inquiry to initiate legal action against those responsible for the behaviour of the national police. Even ONU high commissioner for human rights Zeid Ra’ad Al-Hussein commented the events saying he was “very disturbed” and has invited police to react in a proportionate and necessary way with the situation and urged Spanish authorities to ensure through impartial and independent investigation into all acts of violence. The regional government has invited the European Union to intermediate the relationship between Barcelona and Madrid. However, Juncker has declared that a “formal intervention by the Union is out of the question” because this is a matter of domestic law. Even if legally it may not be so, the referendum is clearly a crisis affecting Europe and which is spreading in other countries as we can see from the declarations of independent movement leaders elsewhere. An important focus of this crisis should be on the political instability that may follow and the uncertainty about the future. Of course, even before the vote the markets had already predicted that: yields of Spanish government bonds raised while Madrid stock exchange is the only one in the continent in sharp bending the day after the vote (1,1% fall in prices). The Spread between Spanish Bonos and German Bunds increased of approximately 7 basis points, reaching 120 basis points with a yield of 1,68%, the maximum from the middle of July. As you can see from graph.1, spread’s instability began on October the 1st with an increase from 114 to 121 (7 basis points). 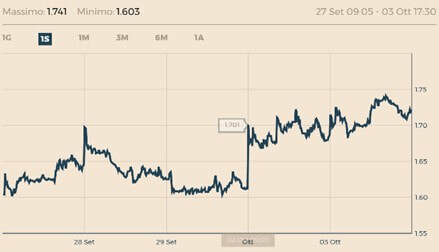 The yield to maturity of Spanish Bonos is shown on graph.2: the increase over the weekend of the vote is from 1,611% to 1,701%. Moreover, the Euro reduced its value against the YEN and the Dollar. The exchange rate EUR/USD was on Monday 1,1760 against 1,1818 on Friday while EUR/YEN was 132.80 against 132.97 respectively. Since September the 6th, when the referendum was approved by the Catalan parliament, the IBEX 35 (a market capitalization index comprising the 35 most liquid Spanish stocks traded in the Madrid Stock Exchange) underperformed comparing to similar indexes in the eurozone. A lot of financial analysis seems to suggest that this may just be a temporary instability and that we should wait for further development to certify whether the impact on the markets will be really significant. “Sales are justified at this very beginning of the week because of the events of the weekend and the perception of an increased political risk” Bloomberg John Davies, strategist at Standard Chartered, says. “In order to certify a deteriorating political stability in Spain”- he adds- “we need further development”. However, many important companies and financial institutions preferred to prevent a potential risk and have already decided to move their head office somewhere else in Spain. Among these companies we find telecommunications group Eurona Wireless Telecom, CaixaBank- the third Spanish financial institution for market capitalisation (30 billion)- and Banco Sabadell. Also Seat, a car manufacturer extremely relevant and symbolic for the region, is evaluating the possibility of a change of residence. Since the region counts 7086 international companies that generate 18% of local employment, the general impact on the regional economy may be devastating, if this trend keeps spreading. The main reason of this decision is declared to be the intent of “protecting shareholders, clients and employees”. In other words, companies and banks are scared of getting stuck in an isolated area excluded from the single European market. A potential declaration of independence would make Catalonia a new state which would be out of important international organisation and probably of the EU. Focusing on banks, their main fear is that an independence would interrupt relationships with the European central bank and the possibility of participating to interbank lending. Consequently, the access to liquidity would progressively be more difficult for Catalan banks. The approval of a law by the central government that facilitate business mobility on national territory has boost this trend and may increase tensions between Madrid and Barcelona. ​Overall, the effects of the vote on the market can be considered, at least from now, relatively limited, but despite that, companies are already adopting preventive measures.